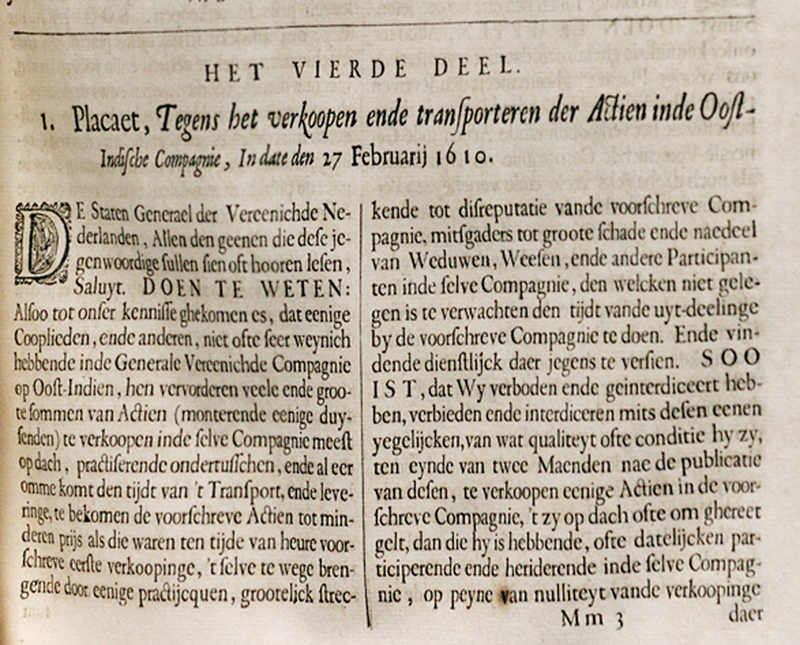 The 1610 proclamation of the States General of the Netherlands that prohibited naked short selling in VOC shares (‘actien’). As far as known, this is the first legislation regarding share trading ever. 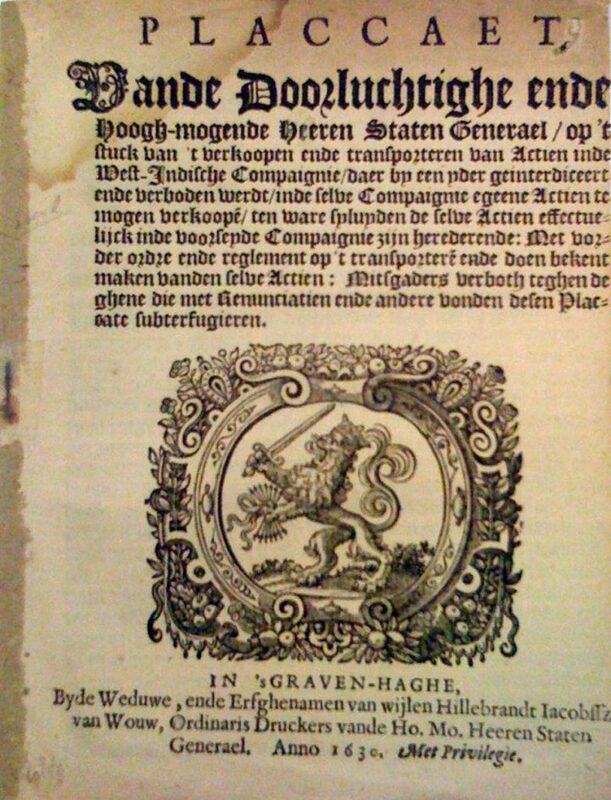 The Dutch West India Company (WIC) also issued stocks on the exchange in 1623. Unlike with the VOC, investors were only mildly enthusiastic. In 1630, the conquest of Brazil led to a brief revival and wild speculation. The States General of the Netherlands intervened with this prohibition of naked short selling. Because of the VOC, Amsterdam had the global scoop when it came to share trading. Logically, Amsterdam was also the first to experience its downside: speculation and price manipulation. 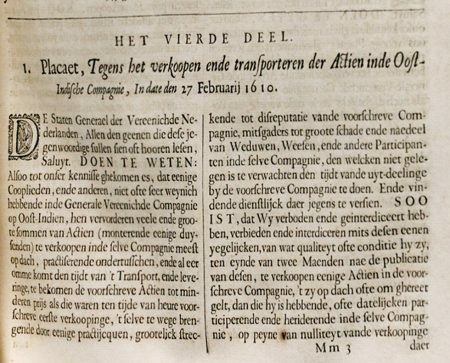 A 1610 proclamation of the States General of the Netherlands prohibits wild speculation on a price drop of the VOC share. As far as is known, this is the first law regarding share trading ever. Today, we would be talking about a prohibition of ‘naked short selling,’ a phenomenon that is still relevant in the 21st century. In this practice, a trader sees a declining trend in the price of a fund. He sells the shares of the fund at the current price, but he does not possess them yet. He buys the shares no earlier than by the time he needs to deliver. Hopefully, by then, these shares have become cheaper. In short, the shares are sold at yesterday’s higher price, but purchased for delivery at today’s lower price. The reason for the 1610 prohibition were the operations of Isaäc le Maire, once a major shareholder and director of the VOC, until he left the company after a fight. He believed the VOC spent too much money on the equipment of the fleet and paid too little attention to the interests of shareholders. In that sense, he was a pioneer in the field of corporate governance. For this reason, he wanted to establish a competing shipping company, but the government did not allow this. The trade monopoly of the VOC could not be broken. 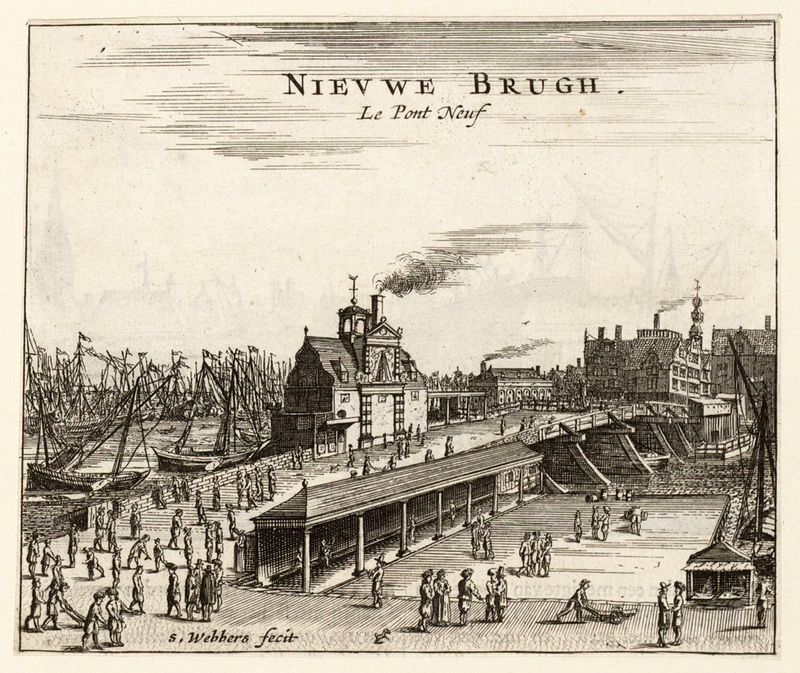 After that, he formed an investment company (‘de Groote Compagnie’) with others that exhibited many characteristics of today’s hedge funds. Naked short selling was supposed to earn him profit, but above all, he wanted to adversely affect the price of the VOC share with it. The government intervened with the proclamation.